Hayagriva (Skt. Hayagrīva; Tib. རྟ་མགྲིན་, Tamdrin; Wyl. 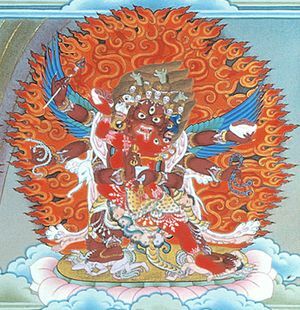 rta mgrin) — the wrathful manifestation of Avalokiteshvara who symbolizes enlightened speech, usually depicted as red in colour and with a horse's head protruding from his crown. Hayagriva is one of the eight principal deities of Kagyé where he is referred to as Lotus-like Speech (པདྨ་གསུང་, pad+ma gsung). The instructions related to this form of Hayagriva are based on the so-called "three neighs of the horse"
In the Longchen Nyingtik, the Hayagriva practice related to Palchen Düpa is called "The Play of the Three Realms" (རྟ་མགྲིན་ཁམས་གསུམ་རོལ་པ་, rta mgrin khams gsum rol pa). Sera monastery has a Nyingma tradition Hayagriva called Hayagriva Very Secret (Tamdring Yang Sang) that is actively practiced. This page was last edited on 19 September 2018, at 00:08.